All of our staff here at BlueSky are committed, fun, and very creative. Middle school teacher, Amee Wittbrodt is no exception to that rule! In her recent curriculum for her middle school kids, she shows us that trash is a big problem. Because we don’t really talk about trash all that much, she’s created an innovative, new curriculum for her students to get them to discuss trash on a very different level. Trash is what we call a “wicked problem” and many of us don’t think about it! Mrs. Wittbrodt took her students through a creative curriculum that encouraged them to think about their trash. We wanted to share this wonderful and fun project with you! The middle schoolers spent 10 weeks learning all about where our trash goes and the impact it can have on our homes, cities, country, and even on a global scale. The goal was for students to become conscious consumers and to understand how their actions can directly impact their family life, their communities, and the entire world. The idea was to tackle a complex issue and allow the students to gain some insight into how the big cities of the world and even their local cities handle trash. Over the 10 week project, the students covered topics ranging from local recycling practices to how landfills work. They learned the importance of their trash habits and got the opportunity to form opinions on things like single-use plastic materials. They completed a variety of assignments each week around the topic of trash. One of the assignments the students particularly enjoyed was the “googly eye bomb” project. 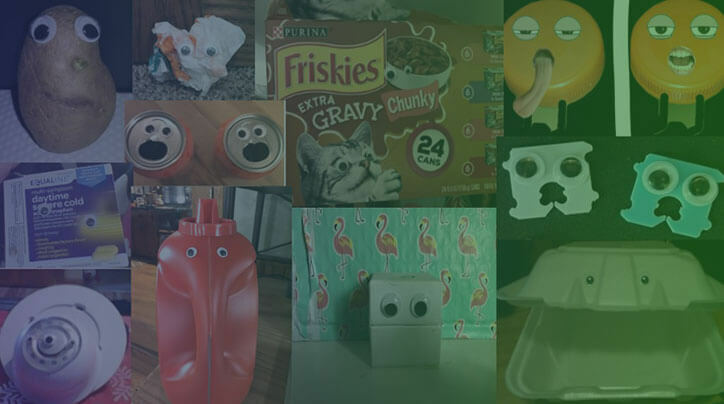 The idea was to find trash or trash containers and put googly eyes on them (pictured above) to really get the kids to notice how trash is all around us much of the time. Through this innovative 10-week course, the kids were able to flex their creative muscles and get out into the community. They learned about all things waste and recycling while getting to form their own opinions on the subject. Amee hopes that the students left the class with a greater understanding of how their actions impact the world and have a desire to make good choices.We believe that our students deserve a creative and effective curriculum. To learn more about BlueSky and the courses we offer, check out our course offerings!